In a perfect world, pets would never leave messes or stains on carpets. Unfortunately, we all know that accidents do happen, and they’re often not easy to clean up. Pet urine can seep deep below the carpets and ruin the pad and floor underneath if not taken care of promptly and properly. This damage can be expensive to take care of and replace. That’s why we developed our revolutionary P.U.R.T.® (Pet Urine Removal Treatment) service that can save even the most severely damaged carpets. P.U.R.T.® is designed specifically to eliminate both pet urine odors and stains in carpets and upholstery. When a pet has an accident on the carpet, the urine quickly seeps lower and lower until it has reached the backing of the carpet and the flooring beneath the carpet. On top of that, many pets will begin to do the business in the same spot every time. The damages can start to rack up and the smell can pack a punch. As the urine dries, the liquid evaporates but the urine crystals become even more concentrated and pungent. Casual cleaning won’t resolve this odor! That’s why we created our P.U.R.T.® solution to handle those stains and smells! When P.U.R.T.® contacts the source of the odor, it immediately begins a chemical reaction that destroys the urine odor. *Additional charges may apply for services based on your unique situation and the amount of time and cleaning solution is required to remove the pet odors. Everyone knows that pet urine in carpets is an inconvenience. Of course it smells bad and leaves stains in the carpets. However, many people don’t realize the deeper health risks associated with pet urine in their carpets. Pet urine is full of bacteria that you don’t want in your home. Think about the people who spend the most time on your carpets: your kids. If you wouldn’t want them playing in a toilet, you don’t want them playing on a carpet that has pet urine in it. In order to eliminate the health risks, you need to completely remove the pet urine, not just mask the smell like a lot of cleaning solutions do. 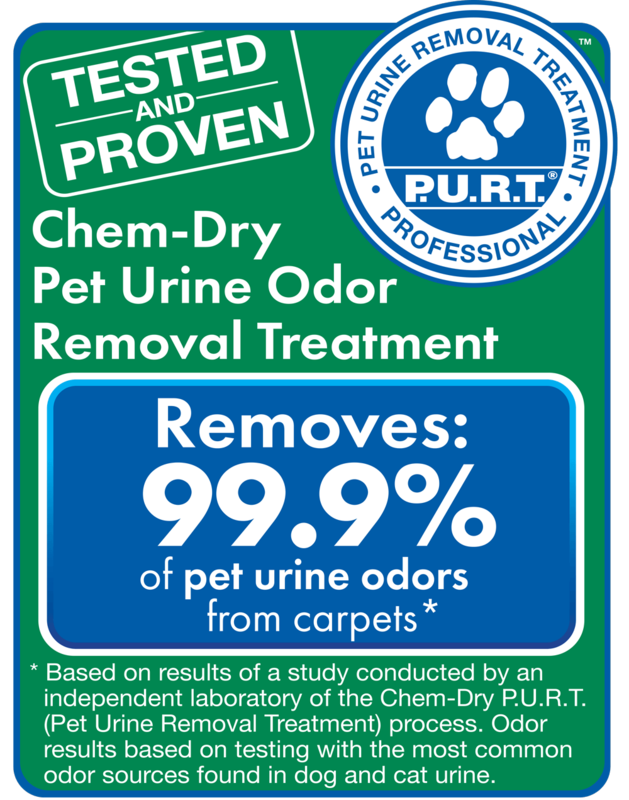 Luckily, Great American Chem-Dry eliminates pet urine at the source. Great American was able to schedule an appointment right away to take care of pet odors from a tenant’s dog. They worked quickly and the carpets look great! And, I should add, they smell great too! We know that when you call a carpet cleaner to remove pet urine stains, you want to know that they will truly be gone after the cleaning. That’s why we put the effectiveness of our pet urine removal treatment to the test by hiring an independent lab. This lab conducted multiple tests of our P.U.R.T. odor remover process to determine its effectiveness in treating pet urine odors and stains. In tests against the most common odor sources found in dog and cat urine, this study found that P.U.R.T. removes an average of 99.9% of pet urine odors from carpets. 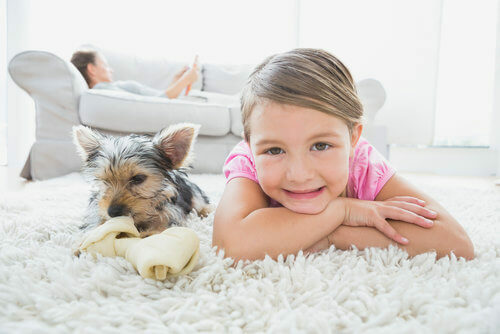 To go one step further, the study also tested Chem-Dry pet carpet cleaning service’s ability to eliminate the bacteria that can be found in pet urine. When used along with our HCE (Hot Carbonating Extraction) cleaning process and a sanitizer, the study found that P.U.R.T. removes an average of 99.2% of the bacteria from pet urine stains in carpets. You aren’t going to find better results than anywhere else in San Diego! Schedule an Appointment with Great American Chem-Dry Today!